If you haven’t seen the movie “A Christmas Story ” you just haven’t experienced life to its fullest. When I was a child, it always came on television somewhere around the first of December. This was before the days of VCRs or DVRs so we would anxiously wait for the night it aired and my family would eat our dinner in front of the television and watch our favorite Christmas movie. The Christmas season had officially begun! This movie has created such fond memories for my brother and I that, over the years, we have given each other gifts that remind us of this bond we had. 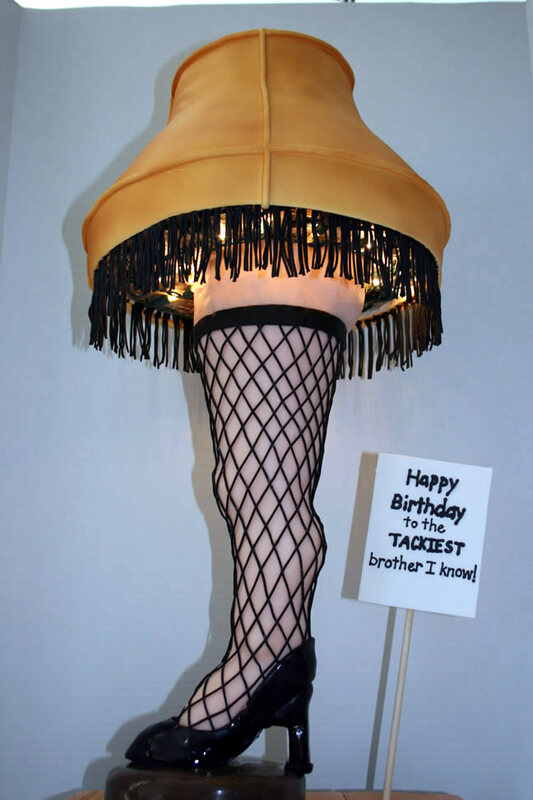 Everything from a copy of the movie, when it was first released on video tape, (my gift to him) to a night light replica of the infamous leg lamp (his gift to me.) 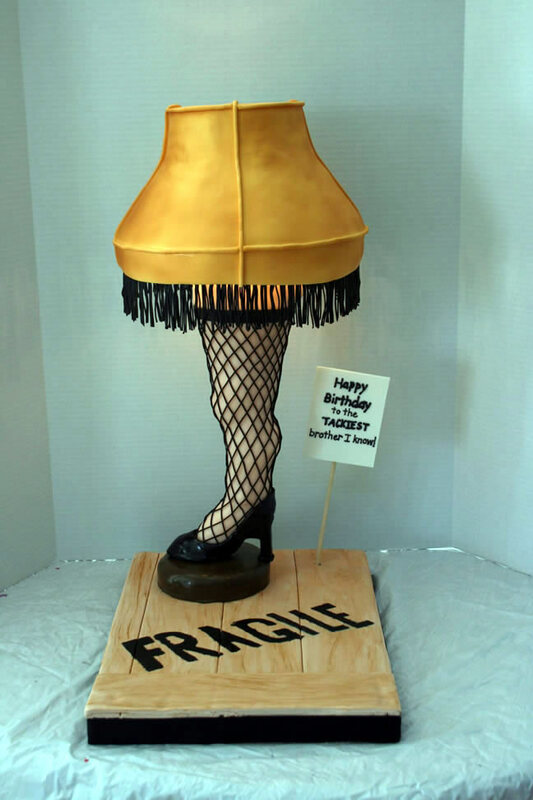 My brother was born on Christmas Day so it is easy to overlook his birthday in the midst of the chaos of the season but last Christmas I decided to make him a birthday cake he would never forget, a cake of the leg lamp. 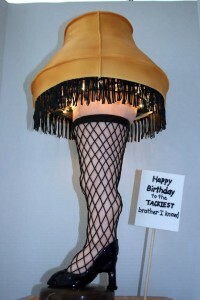 And not only would it be 3-dimensional but it would also light up like a real lamp. 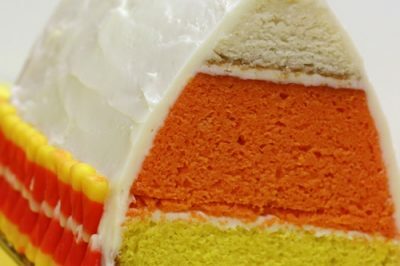 As with all my cakes, I do a lot of planning before I ever preheat the oven or roll out a piece of fondant. Because of the odd shape of this cake I needed to make sure I had solid structural supports. This is where my handy husband, Kevin, came in. He found a scrap piece of laminate from my countertops (notice how the laminate matches my counter), drilled a hole in it for the cords, and attached it using a surface mount threaded fitting. 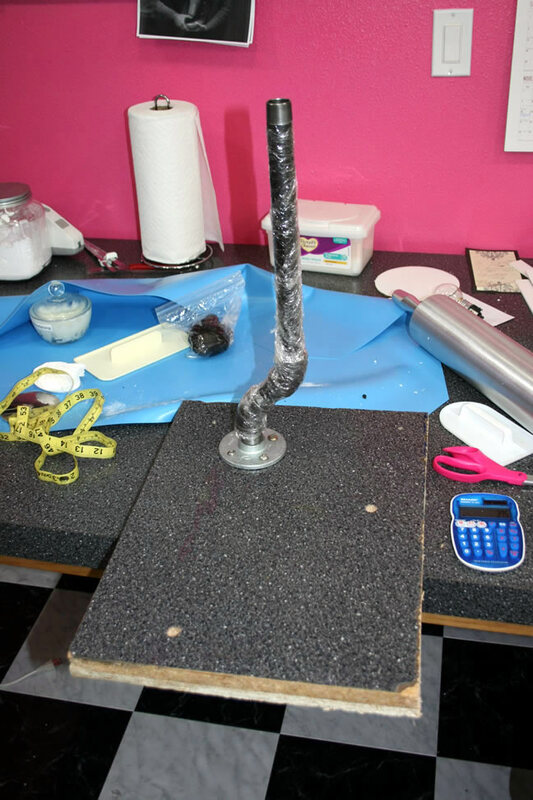 He used 3/4 inch galvanized pipe and a couple of elbow connectors to make the basic shape of a foot and leg. 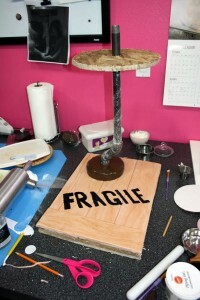 We had to make sure it was raised enough to fit a lamp base and shoe underneath. I then wrapped it all with plastic wrap to keep it food safe. 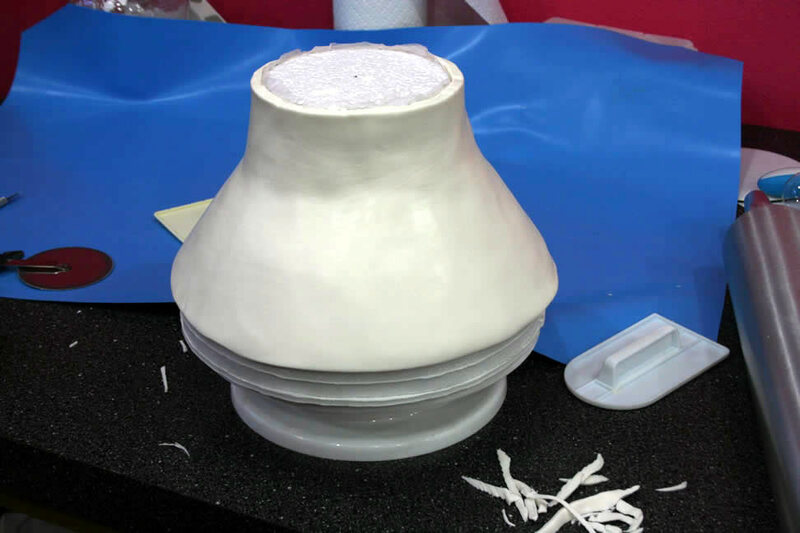 Kevin: To make sure it was strong enough to hold the pipe, the base is made from two pieces of 3/4″ particle board on top of a 1/2″ piece of plywood. The threaded pipe base is screwed to it using large wood screws. To make the turn at the foot, we used two 45 degree elbows turned in opposite directions with a short pipe in between. The top platform where the shade sits is another 1/2″ sheet of plywood cut to shape, screwed to another threaded pipe base. 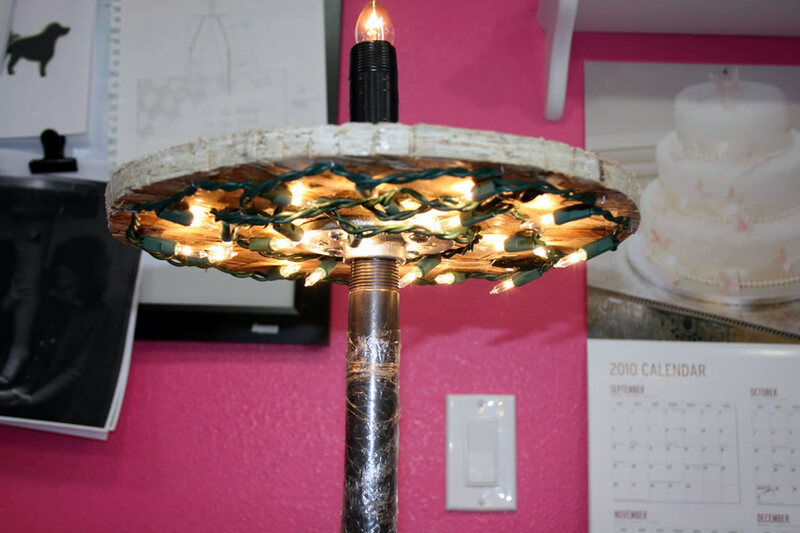 To determine the parts we needed, we took a drawing and the nightlight to Lowes with us and pieced it all together. 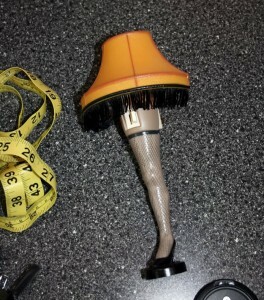 My leg lamp nightlight (the one referred to earlier) served as my example for measurements and colors. 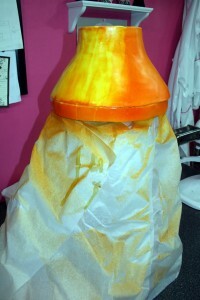 I started on the lamp shade a couple of weeks early to give it plenty of time to dry. I wanted it to be very smooth and for the top and bottom to hang off of the cake so I decided to make it out of gumpaste. I wanted to make a sort of shell that could be placed over the cake and would hold its shape like a real shade. To make this I first carved a form out of Styrofoam. I usually use an electric knife when cutting sheets of Styrofoam but I found out the hard way that you shouldn’t do that when you are cutting thick blocks of foam. My poor knife overheated and burned up. Once the foam was the shape I wanted, I wrapped it with wax paper then rolled out some gumpaste and wrapped it around my form. I used some gum glue to attach my two ends together then set it aside to dry. Next I worked on my base board. In the movie the lamp is delivered in a wood crate so I decided to make the board reminiscent of the crate. 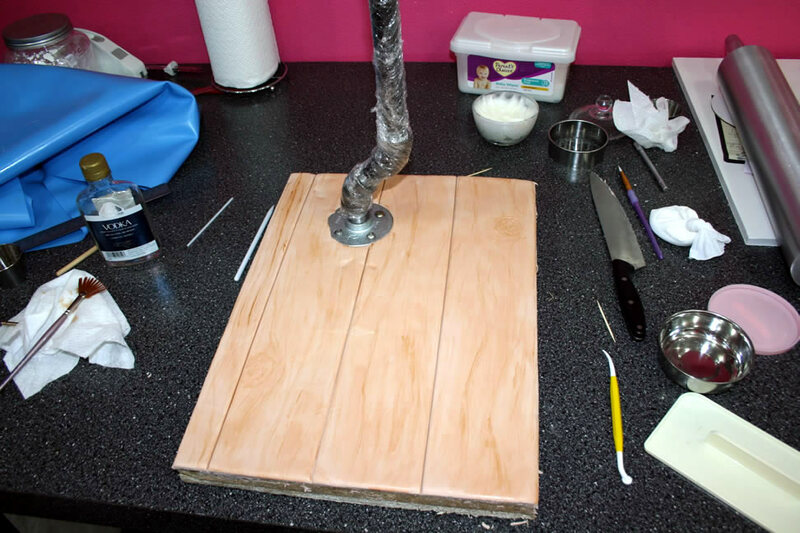 I covered it with a large piece of fondant dyed light brown, then took the edge of a long metal ruler and pressed it into the fondant to form the wood slats. I used a veining tool to give it the look of wood grain. Then I mixed some brown gel paste with some vodka (the high alcohol content of vodka allows the color to dry quickly without dissolving the fondant) to make an edible paint and used a fan-shaped paint brush to gently brush some darker brown tones over the wood slats and in their crevasses. I worked from the bottom up on the lamp. I started with the base which I formed out of cereal treat and then covered with modeling chocolate. 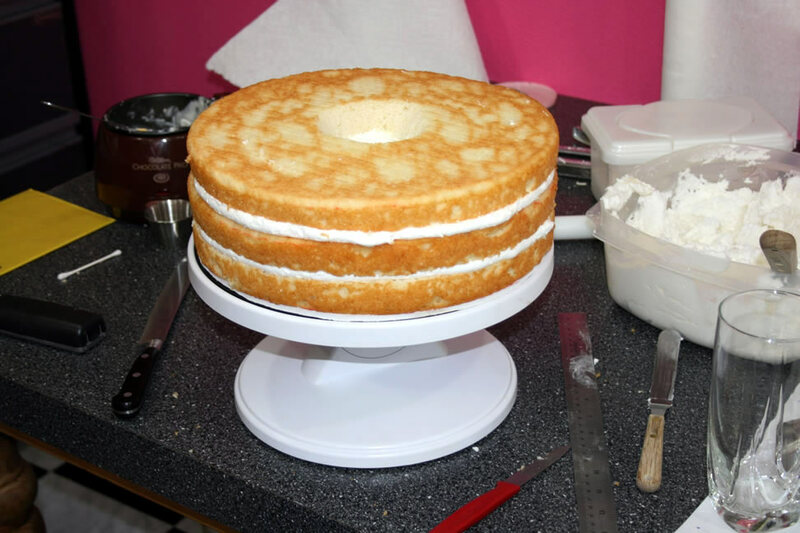 It wasn’t going to actually support any weight since the pipes would hold all the weight of the cake so it didn’t matter that I used something as soft as cereal treats. At this point I called my husband back in to help me with the lighting. 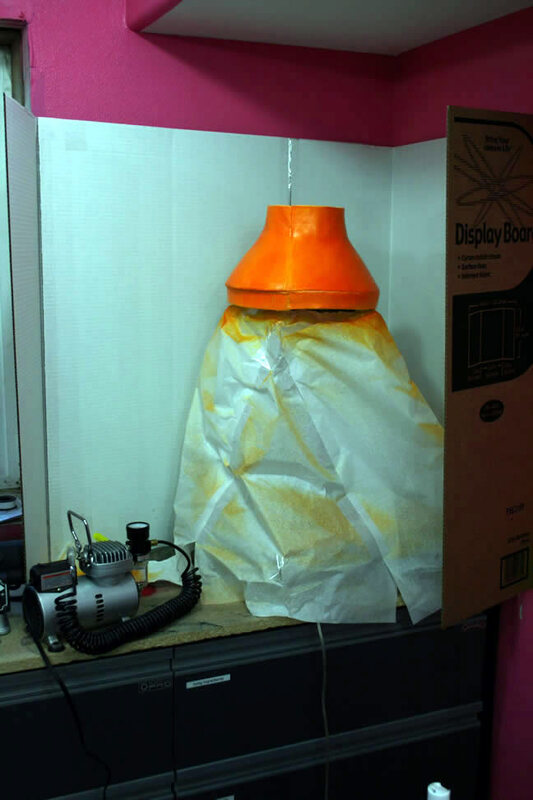 I wanted it to light from the top but also underneath so that it would look more like a real lamp. 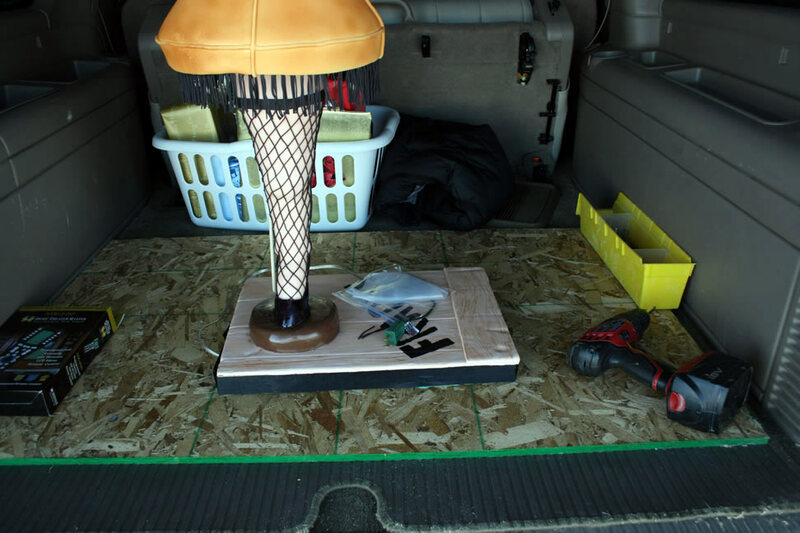 He stapled a strand of Christmas lights to the underside of a plywood board with the center drilled out and ran the cord up into the pipe. He then placed the board on to the pipe, supporting it with another surface mount threaded fitting. 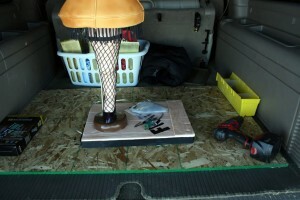 For the upper light he ran a wire up through the center of the pipe and attached it to a C5 Christmas light bulb. It was all lit up. Next I made part of the high heel. I had fashioned a heel out of gumpaste several days earlier so that it was dry and attached it to the base with royal icing. I then cut out a piece of gumpaste in the shape of a sole and removed enough of it so that I could wrap it around the pipe. I put it all in place on the heel, attaching it with royal icing and wrapped some plastic wrap around it all to hold it in place while it dried. 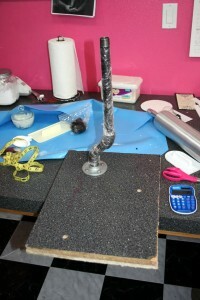 When dry, I added a piece of black gumpaste to the back side to fill in where I had cut it out to fit around the pipe. 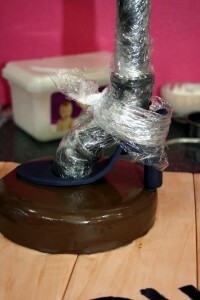 I also filled in the pipe with fondant to give it more of a foot shape. 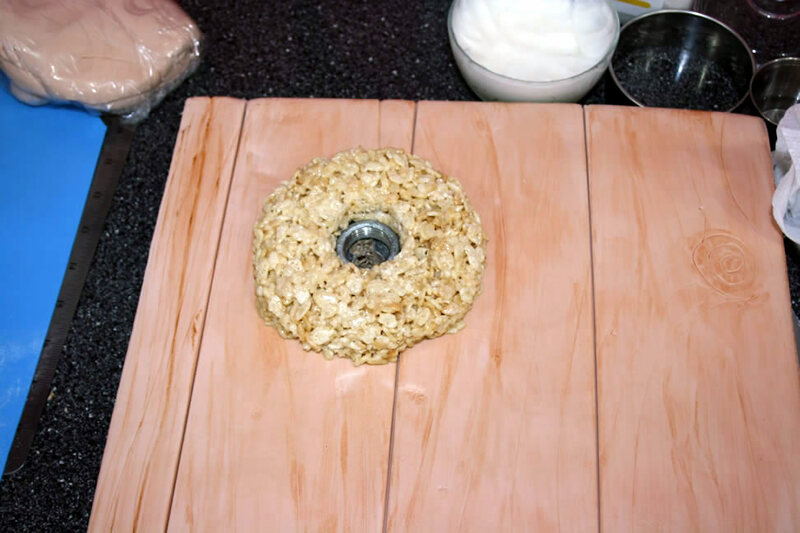 For the leg, I made a few batches of cereal treats and started wrapping them around the pipe. I used my hands to smoosh them into the shape I wanted. I used fondant to fill in dips that formed between the stacks of cereal treats. 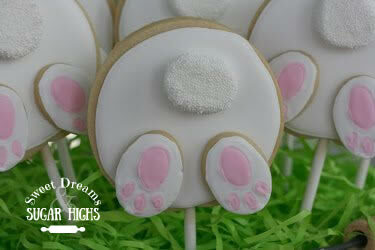 Then I covered the whole leg with royal icing. This was the fun part. 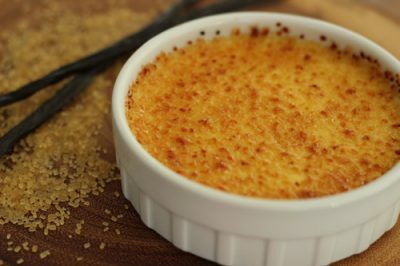 I thinned down the icing, stuck my hands in, grabbed globs of it and started massaging it up and down the leg. I have to admit that it felt a little dirty at one point! 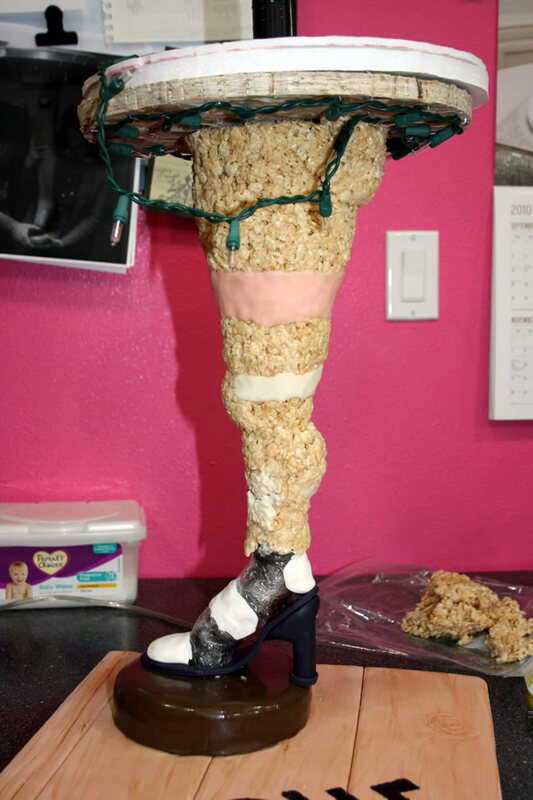 Once the icing dried, and I was sure the cereal treats were solid and could hold some weight, I rolled out some flesh colored modeling chocolate and wrapped it around the leg. I made sure my seams were in the back but I used the warmth from my fingers to smooth them out so that they were still barely noticeable. Next came the fishnet stockings. This was very time consuming. Looking back I think that maybe I should have just piped them on with royal icing but I made a batch of black modeling chocolate and ran it through my clay gun to make long strips. 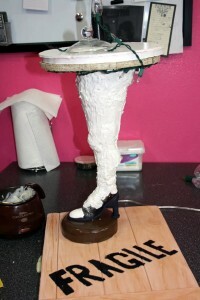 I then brushed some gum glue onto the leg and attached each strip. It was very difficult keeping it even since the leg goes from wide at the top to narrow at the foot. 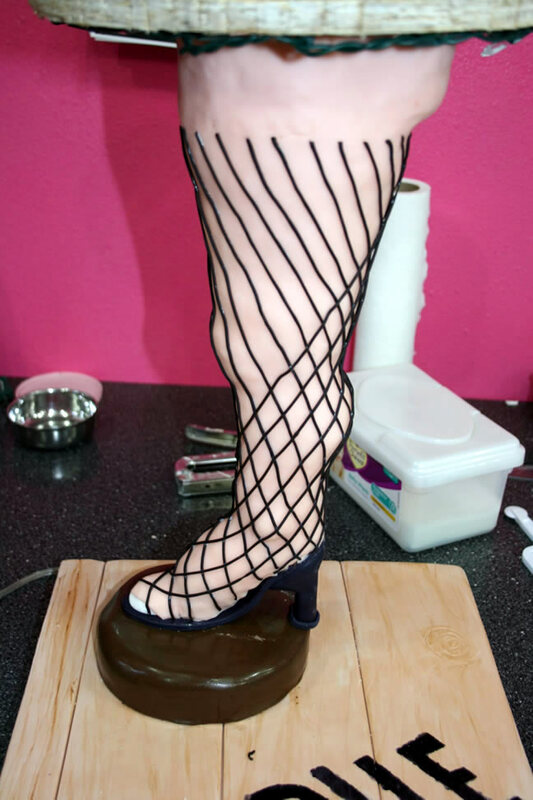 I finished off the top of the stocking by rolling out a thin strip of modeling chocolate and cutting it then wrapping it over the top edges of the fishnet. The cake was inside of the shade. I put it on a foam core board which had a hole cut out of the center, then used a cake corer to hallow out the center of the cake and wrapped a piece of fondant around the center to cover the exposed cake. I made sure the board was just slightly larger than the cake so that the bottom of the gumpaste shade had a place to rest. I used a serrated cake knife to carve it into the shape of the shade, constantly measuring the inside of my gumpaste shade to make sure it would fit. (Sorry I forgot to take pictures of the carving process.) Once it was carved, I placed it onto my pipe stand and covered it in buttercream icing. The gumpaste shade slid right on top of it. Now it was time to color it. I am the first to admit that my skills with mixing colors still need a lot of practice. 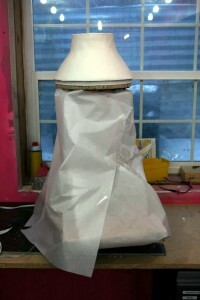 I covered the rest of the cake with tissue paper so that color wouldn’t get all over it. 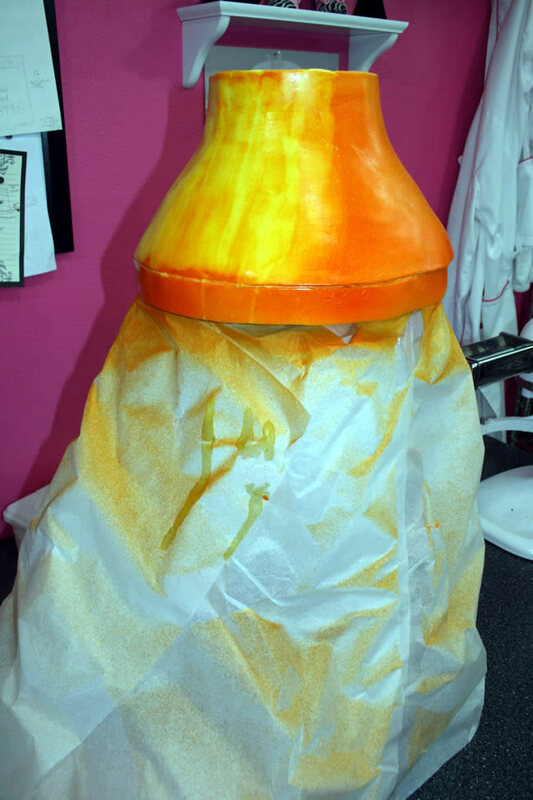 Then I attempted to mix up airbrush colors to get a gold color like the one in the movie. Unfortunately my first attempt ended up being way more orange than gold. So then I tried to clean it off with vodka. Yeah, that wasn’t happening either. Now it was just turning yellow and streaky. I finally accepted the fact that I would need to recover the shade and start all over with the color. There aren’t any pictures at this point because I was very frustrated and would not have been safe with my camera. I ended up recovering the shade with a large piece of fondant. This time I colored the fondant first with some gold gel color. I then laid the fondant right over my original gumpaste shade. It made it thicker than I would have liked but it looked a whole lot better. 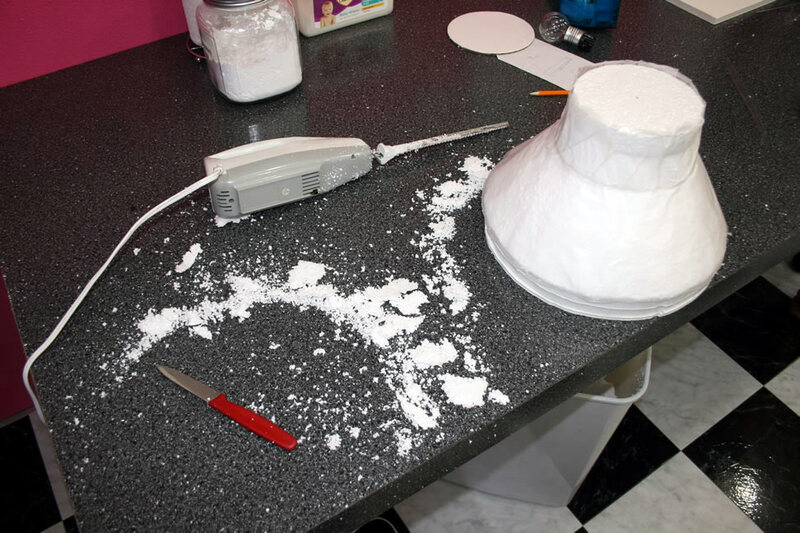 I added trim by running more fondant through my clay gun and attached it to the shade with gum glue. Out came the airbrush again. This time I mixed some gold luster dust with vodka and used that to paint a shimmery gold effect on it. The final results were much better. It was time to finish the shoe so I cut out the rest of my modeling chocolate to make the top and sides of the shoe. I made a mixture of half corn syrup and half vodka to paint over the shoe and give it a patent leather look. For the fringe on the shade, I ran more modeling chocolate through my clay gun, using a disc with smaller round holes than before, and pushed out sections of fringe. I used melted chocolate to attach these sections to the underside of the shade. Of course I had to attach a sign to my brother that would remind him that his sister made the cake. I was so excited when we plugged it in and it gave almost a glow to the cake, much like the real leg lamp in the movie. After all the work we discovered one more problem, we had to transport this cake an hour away and it was quite top heavy. Once again my husband came to the rescue. He had the great idea of placing a large piece of plywood in the back of our suburban and then screwing the sides of the cake board into the plywood. This made it very sturdy and counterbalanced the top heaviness of the cake. Once we arrived at my brother’s house he just unscrewed it and it was ready to go. Not a single piece of fringe fell off! It ended up being a great Christmas and a great birthday for my brother, hopefully one he will never forget. Here is my brother, acting like a 10 year old boy with his cake. I am exhausted just reading this…. what fun you had and what a great job! Your cake room is HOT PINK??? I would have skipped the step of the dry ahead lamp shade and just carved the cake and covered that, but I am super lazy and that is why you’re better than me. I love the picture of your brother. SO FUNNY!! 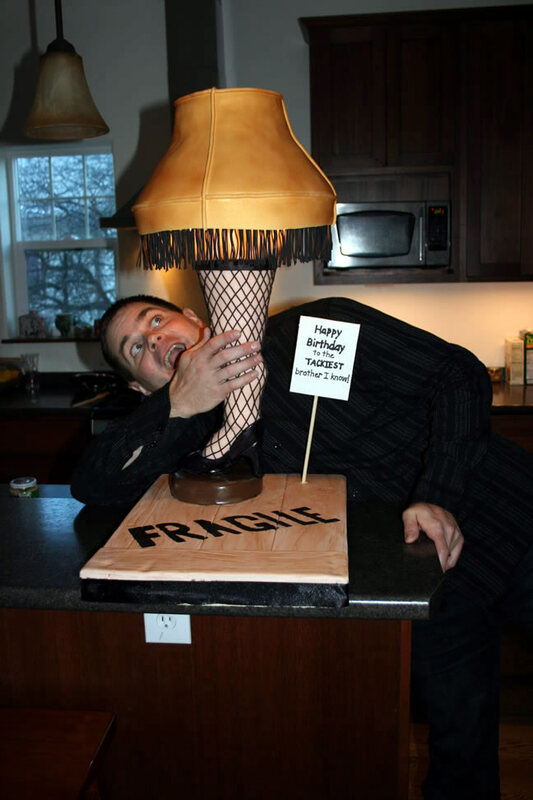 Be careful, it is Frageelay! Hey, here is a link to my blog if you are bored. 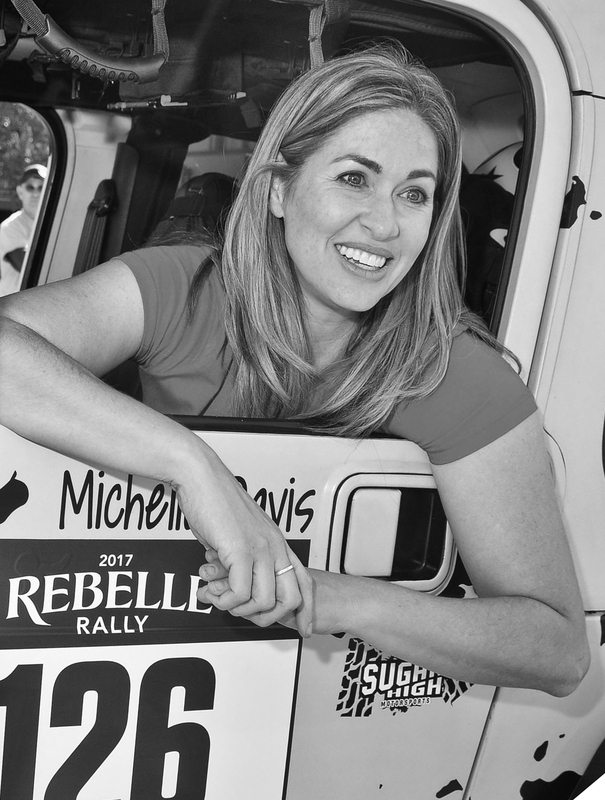 Becky, I LOVE the blog! You are such an amazingly talented woman. If you weren’t so nice and caring I would have to hate you because God gave you way more than your share of talents and skills! I am just thankful you are my friend. Doing these physical exercises will help reduce your cravings and the stress associated with them by refocusing your consideration on the breathing exercise, not your cravings.